This post first appeared in the Wells Journal on Thursday 19 December 2013. Perhaps it’s a sign my roots are now well and truly planted in the West Country but I much prefer mulled cider these days to mulled wine. Red wine, in my opinion, is best drunk as it is. 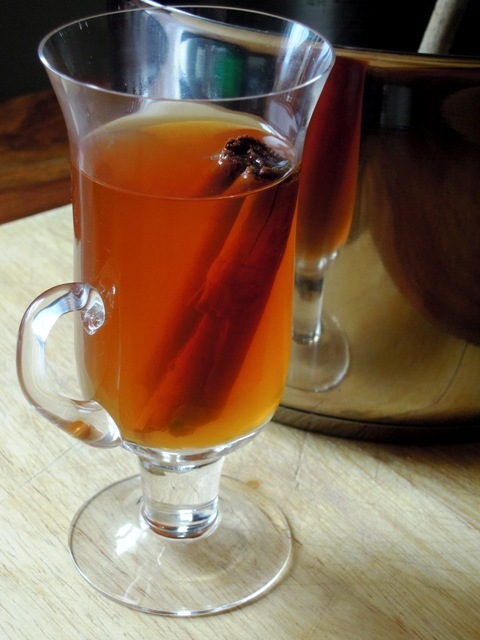 Cider though is just lovely served warm with festive spices. In my version, I add chilli, peppercorns and star anise for an extra spicy kick. I encourage you to use a traditional farmhouse cider and not some of that cheap, fizzy stuff, which Julian Temperley of the Somerset Cider Brandy Company recently described to me as “industrial cider”. According to Temperley, the cider world has become divided between the craft ciders, where up to 20 varieties of local grown apples are pressed and blended, and these ‘industrial’ newcomers, essentially apple-flavoured alcohol, rapidly replacing the gap left by alcopops on the drinks market. Cider has been pressed on Temperley’s farm at Burrow Hill for the past 150 years, amidst 160 acres of cider apple orchards. The Hecks family have been making farmhouse cider in Street since 1840 and they continue to use the old traditional methods of cider making to this day. This is the local cider sold in our village shop and it was one of their vintage ciders I used for this recipe. Last week saw the funeral at Pilton Church of Frank Naish, who at 89 was Britain’s oldest cider maker, using what is thought to be the oldest cider press in the country. Temperley describes him as a fine example of a true cider maker and a wonderful ambassador for Somerset cider. Please raise a toast to Naish as you drink a cup of warming mulled cider this Christmas. Simply place all the ingredients in a large pan and heat gently for about quarter of an hour. Do not let it come to the boil. You may need to strain it through a small sieve as you serve. 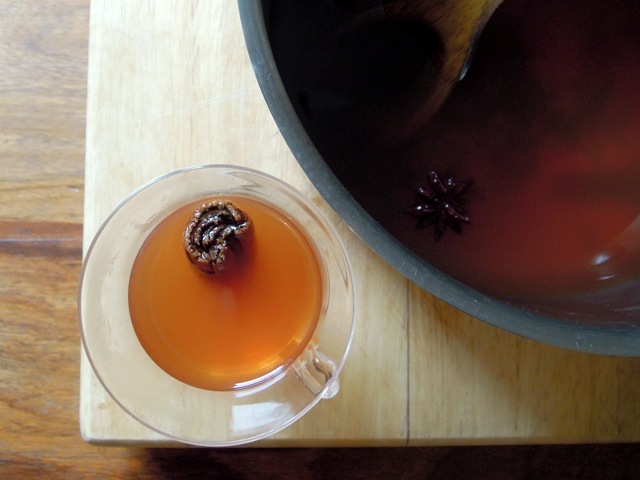 Cinnamon is one of the spices used in this mulled cider, and so I’m entering it into December’s Spice Trail challenge.